Mash the bananas in a medium sized bowl, adding the eggs, coconut oil and maple syrup, and mixing until combined. Then, using a wooden spoon, gently fold through the coconut flour, raw cacao (sifted), baking soda and salt. Place mixture into large muffin trays, (lightly rubbed with coconut oil) or lined with paper patties, filling ¾ of the way to the top. 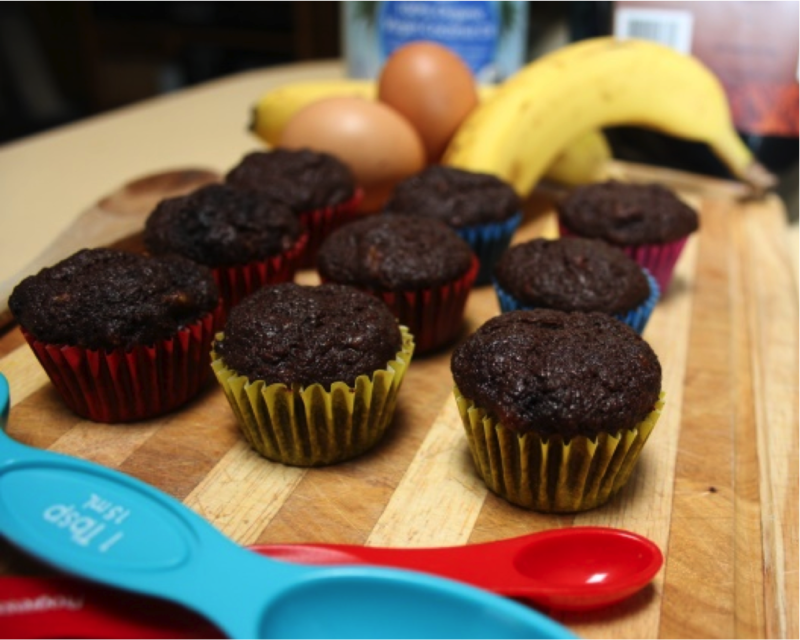 Mini muffin trays work really well too and the mini ones are a great size for sharing. Bake in the oven for approximately 15-20 mins. They are cooked when they spring back when lightly touched in the centre. Allow them to cool for 10 minutes or so before serving if eating straight away, or cool completely on a wire rack, before storing in an airtight container to be eaten later.